The Font of Knowledge: Almost Christmas at Easter. 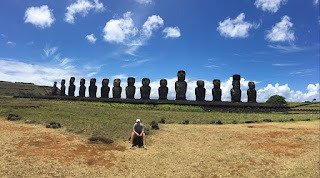 Easter Island - one of the world's most remote inhabited islands. What an incredible Island! 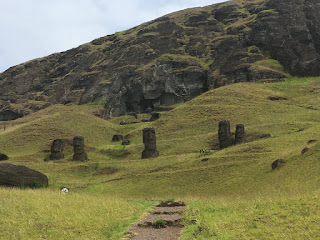 All over the place you find ceremonial platforms (ahu), the famous statues (moai), petroglyphs (rock carvings) and archaeological structures. No matter where you go you must be careful not to damage the land around. Teddy, one of our teenage travellers, being watched from afar. 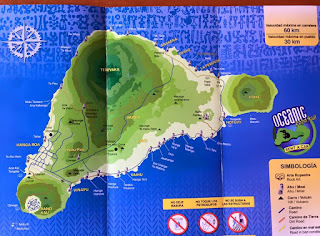 Practically the entire island is a National Park so upon arrival at the airport the best thing to do is to buy a ticket for the duration of the stay on the island. This ticket allows unlimited entrance for five days. 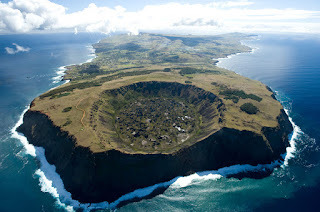 The island is volcanic and is made up of a submarine mountain range. The highest peak is at 3,000 metres from the sea floor. Over a period of several millions of years a number of volcanic eruptions created the island as it is today. The first human occupation began around 12 centuries ago (circa 900). 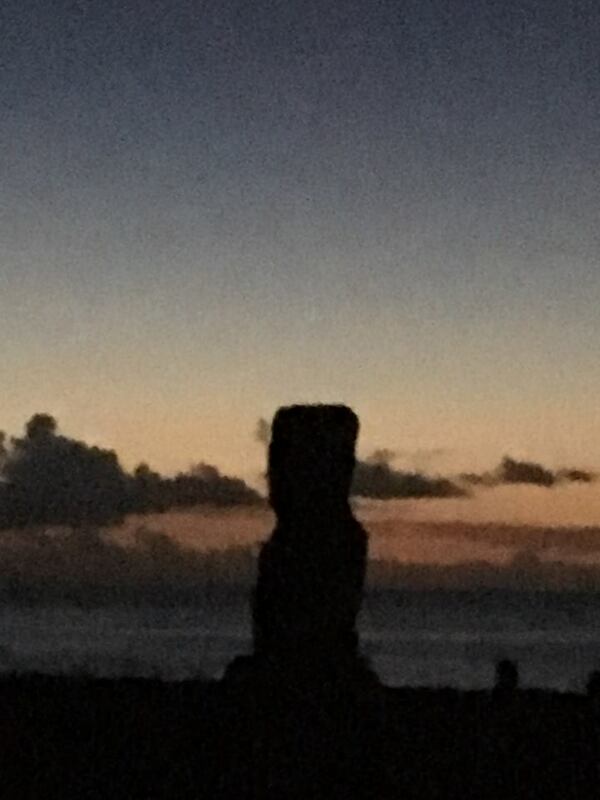 Although the history is controversial it seems that the island was first colonised by a group of villagers from a Polynesian island led by Hotu Matu’a, an ancestor of the Rapa Nui people. The date of this expedition is estimated at around the 8th century although some say that the beginning of the colonisation was the 13th century. 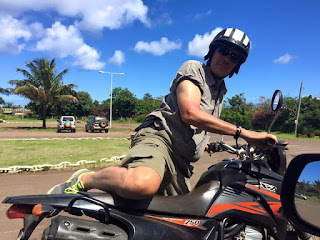 The different archaeological, anthropological, linguistic and genetic studies tend to confirm the origin of the people as Polynesian although it is not possible to ignore the link with South America. 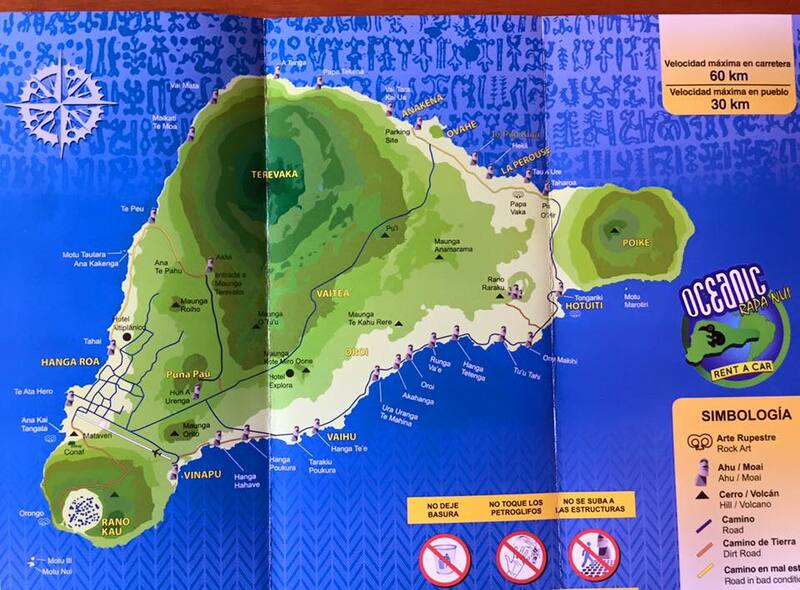 Within a few centuries the population of the island had grown considerably and was divided into ten tribes (mata). They were organised in a similar way to Polynesia involving strips of land running from the coast to the interior. The shoreline was reserved for ceremonial centres. The common families lived in the inside of the island where they planted their crops and bred animals. For hundreds of years the religious belief of worshipping ancestors was manifested in the carving of moai (statues) and the constructions of ahu (ceremonial platforms). 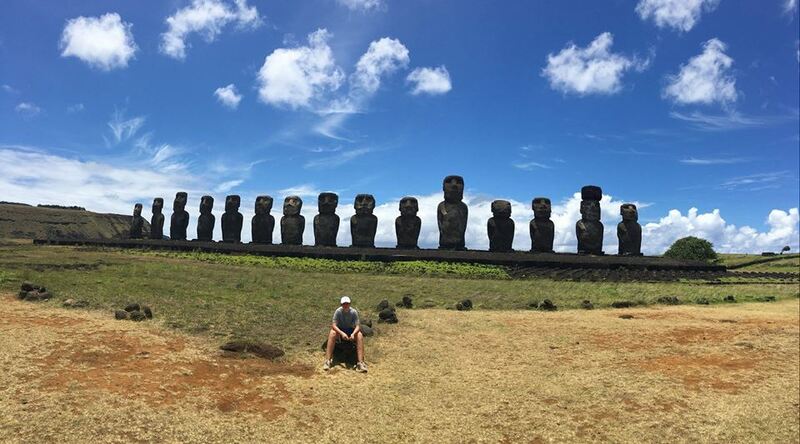 When the different tribes were at war they toppled over the enemies moai (ranging from 2.5 metres to 21 metres high) to weaken them. All over the island we see these fallen statues. Hello? Is anyone coming back? The hundreds of Easter Island Moais were carved out of volcanic stone at Rano Raraku, with about 300 statues still scattered around the quarry like goods in a shop, waiting to be bought. 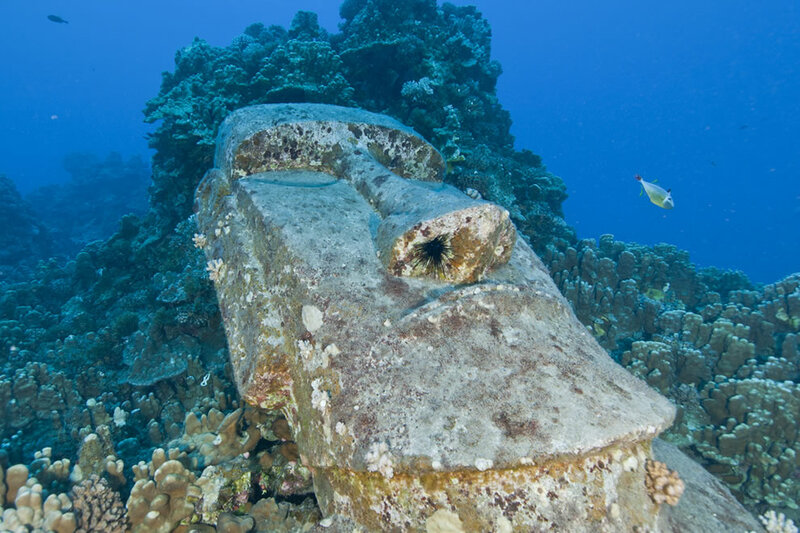 As with the Egyptian pyramids and Inca temples, there are many theories about how these statues were moved to their resting places all over the island. We visited one of the volcanoes, Rano Kau. The crater is filled with water about 11 metres deep. Most of the remaining natural flora can be found here, since the rest of the island has been destroyed over the centuries. Reeds and other aquatic plants, that don’t exist anywhere else on the island, grow here, and the microclimate allows orchids and other tropical plants to grow in relative peace. After visiting the crater, we walked up to the ceremonial village of Orango, where opposing tribes met once a year for the birdman ceremony. 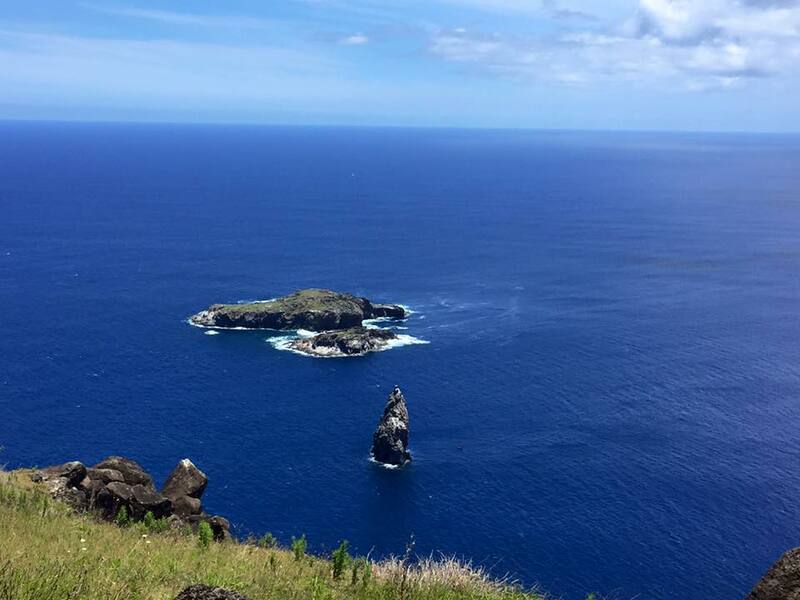 Each tribe chose a man (the hopu of the chief) to climb down a 300 metre cliff to the sea and then swim out to a small island a kilometre away. The men had to wait on the island until the first sterns arrived on the islands. The aim was to take a sterns egg and carry it back to the mainland. The chief of the tribe whose hopu “won” the race became the tangata-manu (birdman) and was considered sacred for one year where he lived in reclusion. The last competition of this kind took place around 1867. The island was “discovered” by the Dutch in the early 1700s, and has had many visitors since then, some welcome, most not. Visitors brought smallpox and other European diseases that have near decimated the population. Peruvians enslaved over half the population at one time and carried them to the South American mainland, Americans have shot natives willy-nilly and British have stolen some of the most spectaular Moais for Queen Victoria. These statues have never been returned and are now found in British museums. Chile later annexed the Island and it remains under Chilean control to this day as a Protectorate. Purely from a personal point of view, this is somewhat of a pity, for it seems that industrial relations in Chile are somewhat different to those we find in Europe. LAN Chile ground staff went on an “Indefinite” strike on 17th December and the prospect of us leaving the island on the 21st as planned is still quite bleak at time of writing (20th). “Oh No! Stuck on Easter Island indefinitely, what a pity you poor dears.” We hear you cry. Okay, Okay, it’s not that bad, but we do have a blog to write in a few days and are beginning to run out of things to say about the place. Mmmmmmm, perhaps we might write an in-depth account of the Easter Island Hula Dance and the attributes necessary to expertly perform one? Just watch out - it may take the form of a Limerick….